Disruptive design changes called for. Next-generation mobile broadband networks may end up looking very different from today's 3G and 4G versions in order to reach the extremely high data rates and low latencies required by future users, a study has found. In the paper [PDF], the authors Federico Boccardi, Thomas Marzetta (both Bell Labs), Robert Heath (University of Texas), Angel Lozano (Universitat Pompeu Fabra) and Petar Popovski (Aalborg University) say 5G must bring disruptive changes to the design of network nodes and the architecture of the networks themselves. This could mean doing away with base stations in favour of device-centric architectures and reconsidering the uplink and downlink concepts along with control and data channels. Multiple information flows would pass through heterogenous device nodes in 5G networks, the paper suggests. 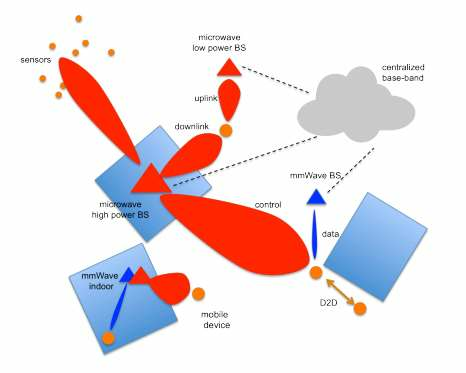 Millimetre wave or frequencies in the three to 300GHz bands hold the promise of carrying large amounts of data in 5G networks, as existing microwave spectrum is insufficiently wide. These include the local multipoint distribution services (LMDS) band at 28-30GHz, the unlicensed 60GHz one and the e-bands at 71-76, 81-86 and 92-95GHz ranges; all in all, dozens of gigahertz of spectrum could be made available for 5G the authors claim, providing a policy for these bands is worked out. Due to the nature of high-frequency spectra, signal propagation will be a challenge but not an insurmountable one. Large adaptive aerial arrays are mooted by the authors, with massive multiple input-multiple output (MIMO) antennae spread out on the surface of city buildings. The authors also put forward the notion that devices should communicate directly with one another, for better performance and to avoid wasting energy. entails a multifold waste of signaling resources, and also a higher latency," the authors said. To better load-balance networks and to reduce latency for services, the authors suggest local caching at the edge makes sense. Meanwhile, the European Commission (EC) and the 5G PPP association announced [PDF] the signing of a contract to develop the next-gen wireless data transmission technology, and to prepare for the standardisation of it and associated components. The public-private partnership will be chaired by Dr Werner Mohr who heads up research alliances at Nokia Solutions and Networks, with the aim beginning to develop 5G technology for use after 2020.